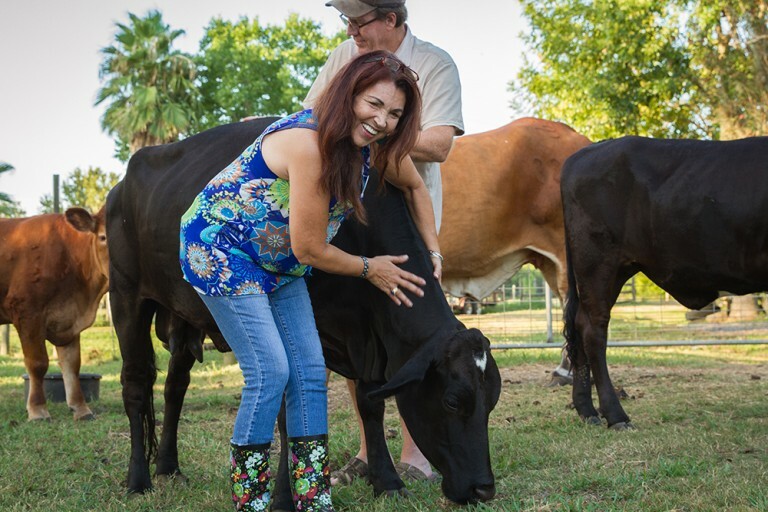 Rowdy Girl Sanctuary is the first documented beef cattle ranch to ever convert from selling them for slaughter in the agriculture industry to rescuing them and becoming a vegan farm animal sanctuary. Renee King-Sonnen, Executive Director and Founder of Rowdy Girl Sanctuary reveals the five reasons why she had a change of heart and became a passionate Animal Rights Activist. 1) I began to witness their family and community when I started bottle feeding Rowdy Girl. I started feeling very conflicted about being in the ranching business. 2) I had an emotional breakdown the first time I witnessed the baby calves get loaded up onto the red trailer to go to auction. That seared into my consciousness that what we were doing was wrong, but I was a ranchers wife and my only choice because I loved my husband was to act strong but I began getting more and more depressed and the fighting with my husband began. 3) I started feeling guilty that we were buying organic top grade meat from the market but that we sent our own cows to slaughter, so I asked my husband WHY do we eat meat from the store but send our own to slaughter? Why dont we butcher our own cows if we are going to eat meat? HIS ANSWER is what put another dagger in my heart - "I cant eat our animals because I know them!" 4) I started watching slaughter house videos - you know, those videos no one wants to watch because they are gory and horribly disgusting. I immersed myself in their world and knew the day was coming when I was going to have to choose between my own soul, and my husband. 5) On Oct 31, 2014 I stumbled upon a video by Melanie Joy called "Carnism" Why we Eat Pigs, Love Dogs and Wear Cows" - I was stunned when at the family dinner they were having a luscious traditional beef stew that everyone was savoring, until the chef announced that they were really eating a golden retriever puppy. That night my mother in law was serving beef stew and IT happened, I slipped past the veil of my cultural and familial conditioning and into the world of veganism and I've never looked back. Renee King-Sonnen, a native Houstonian, is the Executive Director and Founder of Rowdy Girl Sanctuary in Angleton, Texas. She remarried her husband Tommy Sonnen, a multi-generational cattle rancher in 2009 and moved to the ranch. She fell in love with farm animals, having no idea her life was about to transform. After witnessing time and again the baby calves going to the sale barn she became extremely depressed. In October 2014, she went vegan as a result and began researching factory farming and the compassionate alternative, farm sanctuaries. She desperately consulted with leaders in the vegan movement, determined to do whatever she could to create sanctuary out of what was once a beef cattle operation in the heart of cattle country.